What Makes Friendly Springtime Honey Bees Turn Mean? My healthiest honey bee colony, one that was always full of mean bees but has been playing extremely nice so far this year, is back to being mean. Any slight vibration on the hive and the bees come pouring out. I’m not sure what reactivated the mean gene, but these bees are definitely not playing nice anymore. Here’s a three-and-a-half-minute video that shows some honey bees in a touchy-feely kind of mood after having their pheromones thrown into confusion with smoke. I had to smoke the bees to curb the looking-for-a-fight enthusiasm of some of the guard bees (the first minute of the video provides the details). The bees, as far as I can tell, respond to the stimuli of strange-smelling bees and smoke by tasting and touching (and possibly cleaning) each other all over. My guess is they’re getting to know each other again. They all smell like smoke instead of bees, so they have to re-taste and smell each other to re-register in their little bee brains the smell and taste of home, of all their sisters and brothers. A perfect opportunity for any queenless bees looking for a new place to live to slip in unnoticed. My previous video shows how the Guard Bees reacted. P.S. (a few hours later): I’m not sure if the smoke was useful. I just checked on the hive again and saw a few battling bees tumbling and fumbling over each other near the bottom entrance. The smoke seems to have delayed the inevitable… Newspaper combines can be tricky. Bad things can happen if the bees get through the newspaper too soon. That’s why I usually don’t even cut a slit in the newspaper. If the slit is too big, or tears at some point, the new bees can pour into the hive and stir up a storm. I’ve seen it happen with other beekeepers with grim results. I’ve got a feeling that most beekeeping problems are caused by beekeepers. Here’s a short video of some guard bees patrolling the bottom entrance of a hive. The bees were recovering from being smoked after I did a newspaper combine that let the new bees in too fast. Some bee battles started up. Instead of watching a few thousand bees go at it (and the queen possibly getting killed in the melee), I hit them with some smoke. In theory, when the smoke clears, all the bees’ pheromones are messed up, nobody knows who anyone is and they become all touchy-feely getting to know each other again, along with the new bees. Continued in my Touchy-Feely Bees video. February 2019 Introduction: One of the big inspirations for me when I first got into beekeeping was the Backwards Beekeepers out of California. They described themselves as organic, treatment-free beekeepers. They kept plastic out of their hives by using all-foundationless frames, allowing the bees to build comb as they would in nature. They popularized the phrase, “Let the bees be bees.” I loved watching my honey bees build comb on foundationless frames — and I still do. But I don’t wear my Backwards Beekeepers t-shirt anymore. Anybody can let their bees build comb on foundationless frames, but letting the bees be bees in other ways adds up to a few things that don’t work too well in a cold place like Newfoundland. In California, it means not really feeding the bees, which does not work in Newfoundland. Nucs started up in Newfoundland without feeding sugar syrup or clean honey will most likely turn into dead colonies before the new year. That’s because the summer season in Newfoundland, in both warm temperatures and the number of sunny days, is a tiny fraction of what it is California, and the bees simply don’t have as many good days to collect nectar. Unfed nucs in Newfoundland usually grow up to be small colonies that freeze and then starve to death. What I’m talking about is the definition of bad beekeeping. As much as I was inspired by the Backwards Beekeepers, their “let the bees be bees” philosophy doesn’t translate well in Newfoundland. It doesn’t sit well with many other beekeepers in North America either who view it as a laissez-faire approach to beekeeping. I totally understand the appeal of it, though. It represents an ideal that most people who get into beekeeping buy into — big time. I did. It might also be why something like 85% of new beekeepers in North America stop beekeeping within two or three years. (From what I’ve seen, those statistics are accurate in Newfoundland too.) The reality of actually keeping bees is different from most idealized visions of it. Responsible pet owners don’t just go out and buy a puppy because it’s cute. They do their homework and ask questions about the breed, its behaviour and what they can expect from the puppy once it grows into a dog. People who become good beekeepers do the same with their bees. They don’t just buy a bunch of bees, put them in a hive and let the bees be bees. 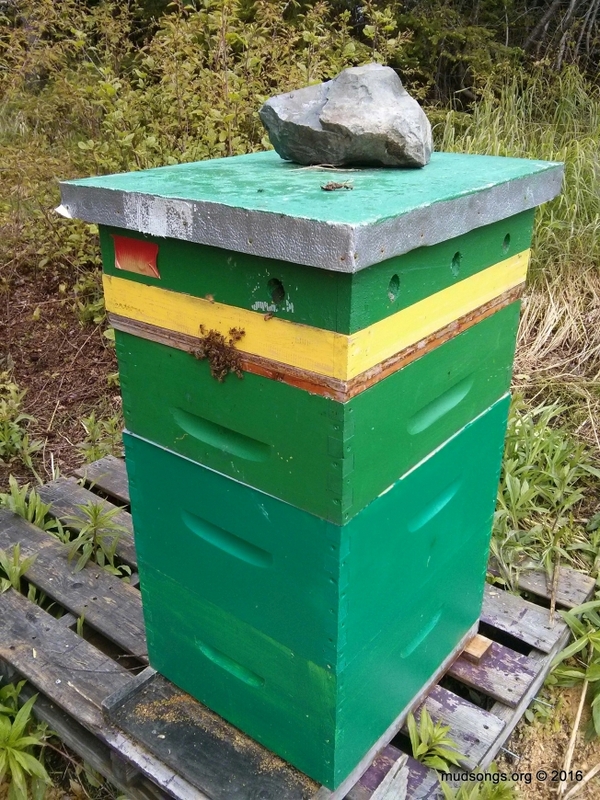 It took me about a year to wake-up to certain realities of beekeeping in Newfoundland. At the time I wrote this post, in 2011, I was still trying to hold on to the highly idealized “let the bees be bees” approach to beekeeping, though you can see from what I say in this post that I was beginning to lose faith in that vision. I’m still in my first year of beekeeping and I’m learning a lot. I suspect one of the reasons I’m learning a lot is that I don’t follow many of the more widely accepted practices that make beekeeping easier. First up are the Backwards Beekeepers out of Los Angeles, California, who have been my number one inspiration from the get-go. They advocate the use of foundationless frames, natural re-queening and starting hives from feral swarms that are better adapted to the local environment than imported queens. Let the bees be bees because they know what they’re doing better than any humans. I love what the Backwards Beekeepers are all about, but it would be foolish of me to think my bees could do as well with 1,500 hours of sunshine a year as theirs do with 3,000 hours of sunshine (and much higher temperatures). And that’s just one of the stumbling blocks. I will continue to follow their example as well as I can, but they present an ideal that I seriously doubt I will ever be able to live up to in St. John’s, Newfoundland, given the severity of our local climate. The reality is that pumping smoke into the hive doesn’t “calm” the bees. It distracts them from the beekeeper’s intrusion by making them think that the hive is in danger of being burned up. They scurry down into the hive and start gorging themselves on stored honey in preparation for a mass evacuation. 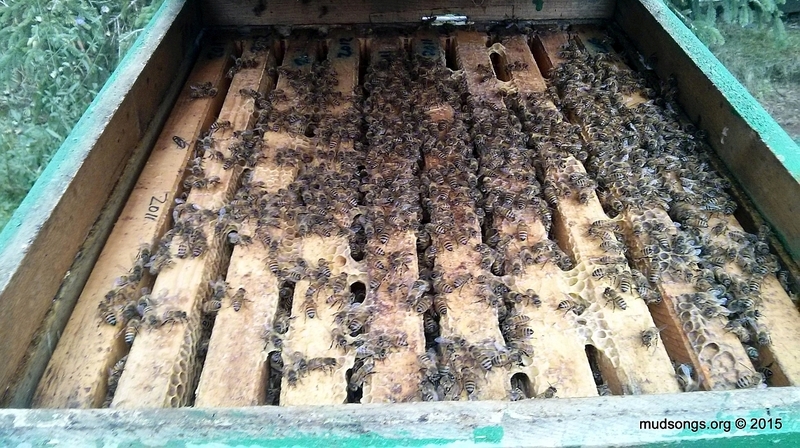 A simple 10-minute inspection of a hive, if accompanied by smoke, can take a couple of hours for the bees to recover. After they realize that the danger is past, they have to put the honey back into the storage cells. They have to make new wax to seal it in again. The water just makes them think it’s raining. Rain means that it’s time to go back inside and leave the beekeepers alone. It also means very little disruption to the life of the hive. Seems great, doesn’t it? I manage to get away with using only a sugar water mist on my bees most of the time. And most of the time, I love it. The bees are calm. They don’t fly in my face. They don’t get all buzzy like they sometimes do with smoke. It’s all good. But then I got into a bad tempered hive a few days ago, and the bees were pouring out all over the hive boxes, all over me, all over everything. It was a mess. I ended up killing a large number of bees when I put the hive back together — a large number of bees that would have been driven down into the hive and lived if I’d smoked them instead. It wasn’t the first time something like that happened. I’ve seen the bees retreat from smoke, and the smoke works. The bees aren’t happy, but they get out of the way and not as many get squished afterwards. I admit my experience is limited, but judging from my experience so far, I think there are times when a smoker can come in handy. I’m not throwing away my spray bottle, but I might keep my smoker on call for now on. I’d rather have a smoker and not need it than need it and not have it again. The Seldom Fools beekeepers use top bar hives, too, which may be easier to manipulate without smoke. My long experience is that the smoke is not damaging, if it is done right. I just give a little puff or two when I lift the outer cover, to let them know that I am coming. It’s the ‘door bell’ for me. When the bees experience smoke their instinct tells them to collect instead of continuing with the daily tasks. This comes as a survival instinct when the forest is on fire. They collect and take in all the honey they can in case they have to leave their home. Of course this does not happened when you do it like I explained above; the bees don’t storm to the honey, stressed about a possible fire. They go on with their work. But they know now that I am coming. So there’s another method for you. I’m not abandoning the ideals that inspired me to get into beekeeping (and there are more than I’ve mentioned here). I’m just learning the difference between theory and practice. The big lesson is there’s nothing wrong with becoming inspired, but it’s vital that I pay attention to my own experience. In the end, I’ll do whatever I’m most comfortable with and whatever I think is best considering our local climate. There’s no one right way to do anything in beekeeping. That might seem obvious, but sometimes I seem to forget it in favour of an ideal that’s just bad for the bees. February 2019 Postscript: While I do like to have my smoker lit and ready to go when I’m digging into larger hives or colonies that I know are unusually defensive, I’d say about 95% of the time I use mist on my bees instead of smoke (or nothing at all). Some bees don’t react to it because they’re so intent on doing what they’re doing that even the threat of rain barely slows them down, but most of the time the bees react to the mist just like they would to the smoke, namely they get out of the way but they don’t gorge on honey like they sometimes do with smoke. But there’s nothing wrong with using a smoker if it’s used properly. When I first started out, as in on Day 1, I virtually drowned my bees in smoke. It was overkill. But I’ve since learned how to use my smoker so that the bees barely notice the smoke. I don’t blow smoke in the bees’ faces. I puff smoke around the hive entrance or just under the inner cover in a way that the smoke wafts around the bees. They get a whiff of the smoke but they’re not coughing on it. And they just casually get out of the way. It works. I go in, do my thing and the vast majority of the bees in the hive have no idea I was there. I occasionally have to use more smoke, but it’s rare.